Hardox provides a unique combination of hardness and toughness with extreme performance and extended service life. 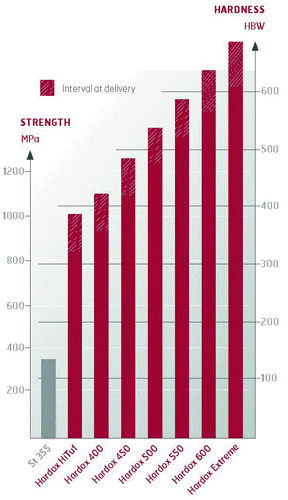 The most important difference between Hardox and other ”hard steel” is the toughness. That is what makes it possible to use it as a structural steel. It can be bent, formed and welded without loosing its properties. HARDOX 400, HARDOX 450 and HARDOX 500 have low carbon equivalent values (CEV) in relation to their high hardness and good toughness. This results in good weldability. Consistent quality, and excellent flatness and surface finish are other characteristics of plate in the HARDOX family. All HARDOX plate can be delivered blast cleaned and anti-corrosion painted. The quality system at SSAB Oxelösund is certificated to ISO 9001. For more detailed information on sizes, quality system, certificates, testing, marking, blast cleaning/painting, etc., please refer to our general product information brochure. Materials expertise and knowledge of the best way of using plate are important to improved economy. Our Applications Engineers have accumulated wide experience of HARDOX in design and production, and will be pleased to offer technical advice free of charge in your plant. This consultancy service is available for the entire chain from selection of materials, machining and welding, right up to surface treatment. SSAB Oxelösund, which is a member of the SSAB Swedish Steel Group, develops, manufactures and markets heavy plate. Our specialties are HARDOX wear plate and WELDOX extra high strength structural plate. The whole of our production takes place in an integrated, process controlled system. Out of our total annual production of around 500,000 tons, 80—90 percent are exported. Our HARDOX and WELDOX grades of plate have become acknowledged concepts on the world market. This is due to a high and uniform standard of quality and a balanced combination of strength, flatness, hardness, formability and excellent machinability. HARDOX owes its high hardness and strength and its good toughness properties to quenching with water in our modern roller quenching equipment. Due to this effective process, the content of alloying elements can be minimized, which is beneficial both to the product and to the environment.